Composer anniversary celebrations are another of classical music's big new ideas that has been quietly dropped. Which is a good thing: because in their ham-fisted execution they did no more than further expose grossly over-exposed composers such as Shostakovich and Mahler. But if handled with flair and finesse they could have done the valuable job of showcasing little-known and deserving composers. 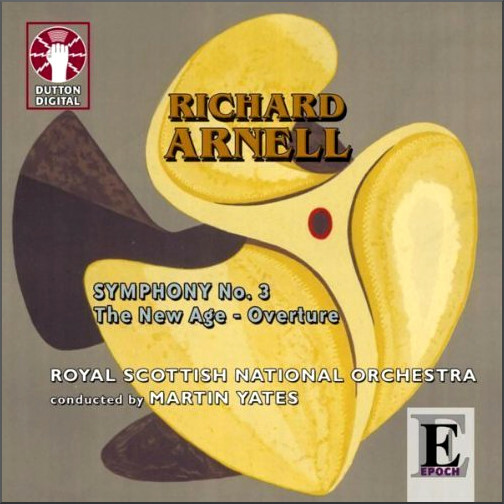 Such as Richard Arnell, the centenary of whose birth falls on 15th September. Even at a time when just a few composers dominate the concert repertoire Arnell's neglect is puzzling. He wrote big meaty symphonies that would surely appeal to today's Mahler-saturated audiences, and his trans-Atlantic provenance frees him from the dreaded 'English composer' label. Despite this there were no Arnell symphonies at the BBC Proms in this his centenary year, nor have any of his symphonies ever been performed at the Proms. And in his centenary week he does not qualify for the BBC Radio 3 composer of the week slot, nor do the station's schedules list broadcasts of any of his music. Instead Radio 3 devotes air time to two more Mahler symphonies conducted by the omnipresent Simon Rattle. But all is not lost, because, as ever, those on the fringes are treading where the mainstream classical media is too myopic to tread. WWFM broadcasting in the New Jersey area and online is running an Arnell marathon on September 14 from 6.00 to 11.00 AM presented by Ross Amico, and conductor Warren Cohen, who knew Arnell, is being interviewed on WWFM between 8.00 and 9.00 AM local time tomorrow September 14th. Born in London in 1917, Richard Arnell followed Benjamin Britten, Peter Pears and Sir Arthur Bliss to the States in the late 1930s, and, like Bliss, found himself marooned on the wrong side of the Atlantic when war was declared. He settled in New York for the duration, and became a member of the Greenwich Village circle that included Virgil Thomson and Mark Rothko. Among the works that Arnell composed in New York before he returned to England in 1947 were his first three symphonies (plus much of his Fourth) and a film score for the US Departure of Agriculture documentary The Land. Paths auspiciously converge here as the suite from The Land was given its premiered by African American conductor Dean Dixon and the NBC Symphony Orchestra in 1942. Among others who championed Arnell's music in America were Léon Barzin, who gave the first performance of the Fourth Symphony with the New York Philharmonic in 1948, Leopold Stokowski, who gave the premiere of the Black Mountain Prelude with the New York Philharmonic in 1949, and Bernard Hermann. In the UK Arnell's advocates included Sir John Barbirolli and Sir Thomas Beecham. Despite advocacy by these musical luminaries, concert performances of Richard Arnell's symphonies are today as rare as the proverbial hen's teeth. But we are very fortunate to have a magnificently played and recorded cycle of the symphonies by Martin Yates - who is doing so much for neglected music - and the Royal Scottish National Orchestra on the independent Dutton label. Passing on Arnell's monumental wartime Third Symphony for the 2017 Proms season was a huge missed opportunity. It is late-Romantic in tone, Mahlerian in scope and duration with a fifteen minute slow movement that Visconti would have adored, while hints of Aaron Copland, Roy Harris, David Diamond and William Schuman betray its Stateside genesis. But perhaps it is good that it did not receive a Proms outing; because its dedication to "the political courage of the British people" would almost certainly have triggered yet another battle of the flag-waving loonies. My thanks go to Nick Rowland for pointing out that none of Richard Arnell's symphonies are available on Spotify. The Naxos Music Library has his Symphonies 4 and 5, as also Punch and the Child, Cello Suite/Sonata, and a short work for organ. My first hearing of his works came thanks to a provincial classical radio station from Italy, right after a work by Rubbra. Hang your heads in shame, BBC 3 and Proms mandarins. Shrivel with embarrassment. And the same goes for two bloggers I have in mind at the moment. Must people make political comments at all costs, everywhere ? The loonies, flag-wavers, and others, don't necessarily share your opinions, if indeed they have any interest in them. I found the article very informative, otherwise. Actually I thought my final sentence and the post it linked to was apolitical, and that the flag waving loonies at the Proms were the ones making political comments at all costs, everywhere.